Shaped like a lasso that’s been dropped on Colorado’s pristine West Elk Mountains, the West Elk Loop Scenic and Historic Byway unites three very different mining communities, gets within arm’s reach of four diverse wilderness areas and stops into mountain towns like Crested Butte, Gunnison, Montrose and Carbondale. 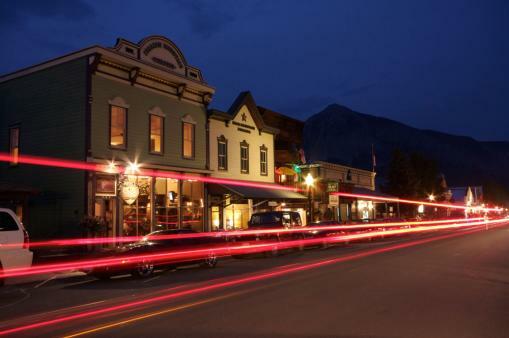 • Visit the galleries and boutiques in Carbondale, a hideaway that takes in view of Mount Sopris (12,953 feet). Sliding beneath the bridge as you enter Carbondale is the Roaring Fork, a river with cottonwood banks, polished stones and fat rainbow trout. • Situated snugly in the Crystal River Valley is the quaint town of Redstone. On one side of the byway are beehive-shaped coke ovens once used for processing coal. On the other, in the heart of the town, is the 42-room Tudor-style Cleveholm Manor, a home once occupied by the town’s founder. • Up the river lies Marble, a sleepy hamlet where some of the finest marble in the world has been mined, including that used in the Lincoln Memorial and Tomb of the Unknown Soldier in Washington, D.C.
• After Marble, the byway crossed McClure Pass through the Upper North Fork Valley before reaching Paonia and Hotchkiss, small towns that anchor a network of orchards and farms in the area. Buy a bag of farm-fresh cherries or a bushel of nectarines from a farm stand in the area. • Veering to the south, the loop passes the Black Canyon of the Gunnison National Park between Montrose and Gunnison. No other gorge in North America combines the narrowness, depth and sheer drop-offs of the Black Canyon. • The town of Gunnison is equal parts college town and ranching community, where wide streets tell of the town’s original hopes to be Colorado’s future state capitol. Stop by the Gunnison Pioneer Museum to see a railroad depot and re-created schoolhouse. • Finally, there’s Crested Butte, a town surrounded in summer by so many blooming meadows that the Colorado legislature dubbed it the Wildflower Capital of Colorado. Much of the town resides within a district where Victorian buildings decked in vibrant colors preserve the aura of the past. Note: The section of the West Elk Loop that crosses Kebler Pass (between CO Hwy. 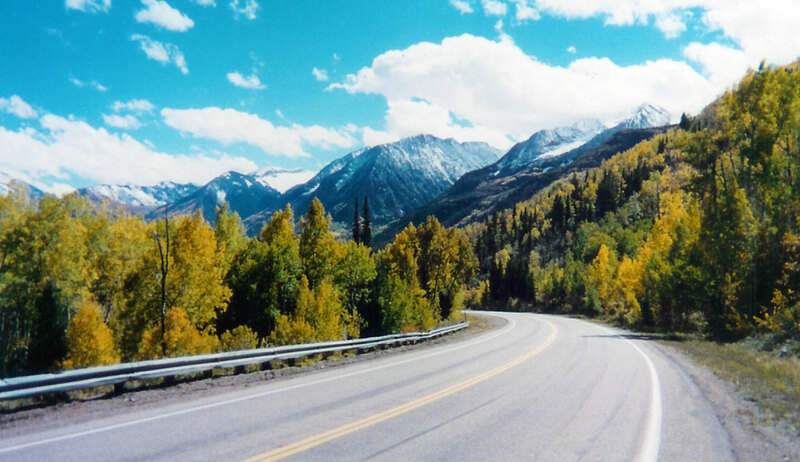 133 and Crested Butte) is closed in winter (Nov.–April). 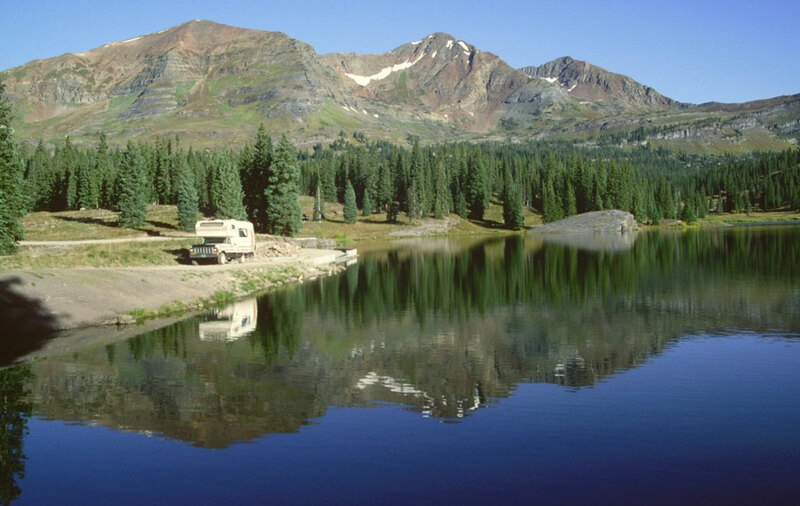 Photos: Historic Crested Butte, Lake Irwin near Crested Butte, highway near Redstone.